Want to get under my skin? Say “it’s too late for her to start”, or “she’s not any good” about an 11 year old, or a 14 year old, or anyone for that matter. For the longest time, I wanted to play hockey. My dad was a goalie and I grew up hearing stories of his glory days defeating Mike Richter in an All Star game. The only pro teams I would even watch had to be the Philadelphia Flyers or their minor team, the Phantoms. One fateful morning, an announcement went out about our school’s ice hockey team when I was in 7th grade. That was it, I couldn’t take no for an answer anymore because there was a team for me. My dad tried his best to prep me the entire summer: learning how to skate, dress in goalie gear and stop pucks, but I was no where near ready for evals. Our school program was big—we had like 5-6 high school teams and three middle school teams going into my 8th grade year. I was also one of three girls, but that didn’t even faze me in the slightest because I was there for hockey. That first eval, I was one of three goalies and according to my dad I was a total embarrassment. All my 8th grader classmates mocked me for how awful I was. But because I was one of three goalies, the coaches of the lowest ‘C’ level team begged my dad to let me play. They needed me and had to reassure him that I’d get better. That year was still one of the best years of my life. I went from a total sieve to the MVP of the team. We beat an undefeated team 3-2 in OT to make it to the championship—a team that beat us earlier in the year 13-0. The team we played in the championship, some of those guys would become my best friends and favorite teammates. It was an unforgettable season. All that was about to change though. I had so much pride in playing for my school and did everything I could to prep myself for high school hockey. I wasn’t prepared for the culture shock I was about to experience. I walked into our home rink for tryouts and I was one of the first kids in line to register, plus I was the only girl. These high school boys towered over me and it was a little intimidating. But when I got to the front of the line, the moms looked right through me as if I didn’t exist and continued to register every boy behind me. As I stood there awkwardly, one of them turned to me and said “Figure skating is on rink two.” So I had to justify being there and they weren’t happy about it. They made a big stink about the locker room situation and managed to put me in an empty room. But when you have five teams worth of high school players, there’s not enough room for all of the guys. The boys knocked on my door and politely asked if they could just put their gear on: “We won’t change in front of you”. It didn’t bother me at all, and they were all really kind to me. But one of the moms saw the boys in the room and immediately pulled me out. I didn’t see what I did wrong and I started to panic before evals even started. Luckily, I hit the ice and I immediately switched to excitement. These guys were good—I was challenged and thriving. The coaches ordered the biggest guys to shoot slapshots on me just to see if I was scared (which is the last thing I’d ever be!). Afterwards, one of the coaches personally came up to me, impressed with what he’d seen and said I’d made the JV team. I was on cloud nine. My mom jumped up in arms ready to fight them for calling me out. The result? We were going to have goalie tryouts for the first time ever in our club’s history. I had to make the top eight out of 12 goalies to make it. It’s not like I had a lot going for me. 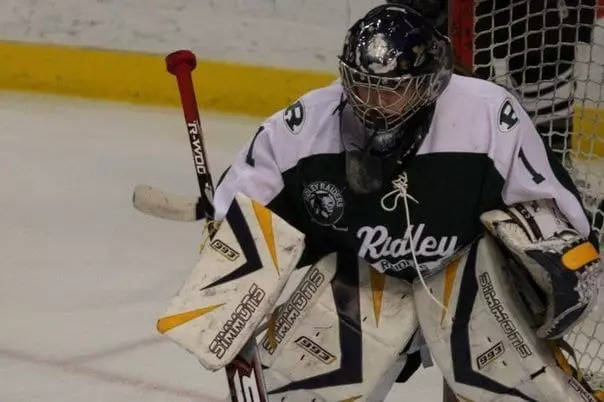 Yeah, I was fearless, but I was the only girl, with only a year of experience being judged by a college goalie coach, facing college hockey players. The funny timing about the goalie evaluations was that the team I faced in the championship had me play goalie for them in the spring league. We had a championship game to win the same day, just before our goalie eval. I couldn’t miss playing in a championship! Well, we won our game and with no time to celebrate, I had to run over to the next ice sheet for my goalie eval which I was now running late for. Thankfully, I missed the skating part which probably would have hurt me the most. I was doing well in drills/games, but then the final drill (every goalie’s favorite) was the rebound game. The first goalie goes in—he was the best goalie in the club who was a senior and starting goalie on the top varsity team. He gave up a goal after three shots. Next goalie goes in, he’s my year and is the ‘rising superstar’. Goal after three shots. Well my turn comes around. I stopped seven straight shots and a rebound comes out to the slot. This grown man winds up and shoots a slapshot at my face. My whole helmet exploded off my head, but my first reaction was “where’s the puck? !” I tracked it to my left/glove side, and slid over to where the guy was catching the puck and ready to rip it on net. Meanwhile, the goalie coach is screaming on the bench “DON’T SHOOT!”. With no helmet, I caught the puck and pulled it into my chest. I looked up to an entire rink—players, goalies, and parents who are corralled around the boards—giving me a standing ovation. It’s easily the dumbest thing I have ever done, but I’m convinced it got me on the team. I was ranked the fifth best goalie out of 12. There was nothing anyone could do to get me off the team then. Also, I know it sounds like a scene from a movie, but it really happened that way. At our first JV game, I was starting goalie against a program known for their talented hockey teams. We had what felt like 500 people in the stands all from our side, but it felt like they were cheering against us. We won 5-3 and I made some unbelievable saves, including five breakaways and one that I was totally beat on and hit out of the air with the back of my paddle. After that game, the only people in the stands were parents. You might think: if boys’ hockey was that difficult, just go to a girls program. I didn’t have much luck there either. First, there were not a ton of options. I enjoyed playing u19 as a 14 year old—the girls and coaches were so welcoming. The next year I made the tier 1 team which was ranked third in the nation. You’d think that it would be a great experience then, right? Our team was full of ‘clicks’ and the one side really bullied me. My natural messy hair is difficult to maintain so I always wear a hat. The girls took my hat off my head and started to throw it around the locker room. One girl shoved it down the back of her hockey pants so I reached around to grab it. I stormed out of the locker room to the girls chanting how I was a lesbian trying to feel them up. I immediately got up and walked out of the locker room. I refused to play. I tried to tell my dad the story of why I wouldn’t go back in and he didn’t want to hear it. After being forced back into the room, I was told I was now starting even though it was originally the other goalie’s game. Fast forward to winning districts and we’re now set to go to Nationals. Fortunately, or unfortunately for me, I end up passing out three straight days in school so I was taken to the hospital and missed the only time I ever qualified for Nationals. What felt like a million tests for a straight week resulted in the diagnoses that my migraines get so bad that I’ll pass out. Meanwhile, some of my closest friends on that team who went to Nationals went all the way there and didn’t play a single shift. One girl was the second on the team in goals! It didn’t matter if the team was losing 6-0, they didn’t play. The parents were so fed up they pulled the girls halfway through the last game. I give them so much props for that. I really didn’t want to return the next season, but my parents pushed me to go to evals. You’d think being out of Nationals because you’re in the hospital would make people want to check on you/ask you how you’re doing… The coach didn’t say one word to me, so I knew I was cut before I even stepped on the ice. One of the better players tried to reassure me about how I had the best stats in the league. I told her it didn’t matter and it was fine, but the truth is it still hurt. And I was right. I was cut. I wanted to share a letter about my feelings about the team, how we should be treating each other better, but I wasn’t able to. I had to send it out in an email after the fact. And it wasn’t until then that other parents responded back saying how strong I was to deal with the bullying, name calling, and everything else I dealt with that season that my parents finally understood what I was going through. I tried one more year of girls hockey—another girls tier 1 program. The girl were nicer, but I had a tough time dealing with a parent coach. He was unforgiving on us. Once, he kept us in a locker room for over two hours after our last game ended screaming at us. After we tied a good team to start a tournament, he made us run three miles on the beach, then took us to a rock and told us how none of us would ever amount to becoming hockey players so we should just quit. It made for a miserable year. The final straw, was when we had four straight games against my old tier 1 team at the end of the season. I was supposed to get two games, and his daughter was supposed to get two. In the first game we got blown out with her in net. He wanted to give her a chance at redemption, which was fine with me. It was a closer game, but we still lost. The third game was supposed to be her turn anyway, so she played again and it was a bit lopsided. He promised I would definitely play the very last game. I was so pumped, my whole family and extended family showed up for this game because of everything I went through the previous year. I’m sitting in the locker room psyched up to play and after he gives his pre-game speech, he says she’s starting again. Everyone in the room just looked shocked. I was devastated—I shrunk into my goalie gear. I sat on the bench for the fourth game in a row, never getting a chance to redeem myself against my old team. My family was heartbroken. I was convinced I’d never have any part of girls hockey again. At least I had my boys, I had fun and proved my worth to the team/club. We had competitive teams and they really became like a family to me. Everything I went through, the good and bad made me want to coach. I got into coaching towards the end of high school and never looked back. Playing tier 1 for those two years, I had some college offers. I had no desire to look at them, though with what I went through at the highest level of girls competitive hockey before college. In my head, college would be the same thing and what was the point? I’m not good enough to continue playing after college anyway. I’ll stay local and keep coaching. So I applied to a local State College so I could stay close to home/coach and somehow I got roped into playing on the women’s college club team. One of the first practices I went to, a player made a comment about how “I shouldn’t be such a try hard in the drills.” Well that was the sign that I was not going to last with the team. I made it two years before quitting. However, I saw the men’s D3 club program and there were a lot of players I played with and against over the years on that team. I thought it wouldn’t hurt to contact them about trying to play. Guys hockey was always more fun and challenging. I left totally defeated, but the coach and GM were still so kind to me. If I wanted to be on the team, we could have fought it, or I could practice with the team and be apart of the team in every way possible without being on the roster. The last thing I wanted was to go through what would have been a very public fight, so I accepted being part of the team without the acknowledgement. That first season was the best one. I really was welcomed and treated just like any other player. There was one player who made inappropriate comments to me and I told one close friend/teammate, who then told the coach. He was quickly kicked off the team. I felt responsible because if I wasn’t on the team, it never would have happened, but the coaches and GM said they’d always support me and to not accept being objectified. I never felt more empowered/supported in my life. Since I couldn’t dress for games, I did whatever I could off the ice to help the team. Once, one non-dressed player was giving me a hard time saying how I should just go because I’ll never be a real part of the team. One of the assistant captains grabbed him, threw him against the wall and told him “She will be more apart of this team than you will ever be!” One assistant coach once said, “Lauren is the best thing to ever happen to this team and you protect her at all costs.” It was so nice to feel appreciated/wanted, even if I wasn’t technically on the roster. Each year after that, I took a bit more of a back seat. I took less ice time in practices and got more involved in off-ice activities for the team. The culture started to change, especially with new coaches. They were still welcoming, but it wasn’t the same. Then I was burnt out between school, hockey, and coaching. I was having a meltdown, and even seeing the psychologist at school. I decided to take time for myself. I took a job working as a graphic designer designing jerseys. I loved that job and it gave me some flexibility to continue whatever I wanted to do next. One of my college coaches was talking to me and pushed me to continue hockey, but it didn’t make sense to me. There was nothing left but Olympics. He told me about the CWHL and pushed me to submit my information. A few months later, I received a call from the assistant GM of Boston, a fellow goalie who played majority boys hockey that loved my background and story. She told me they were going to draft me but I still needed to make the team. My parents were thrilled. My mom wouldn’t miss my first tryout and drove me to Boston so she could watch. She walked into the rink first, and the first person she started to pester with questions on where to go and what to do was Hilary Knight. There was a lot of “Aw, she brought her mom! That’s so cute!” So, yeah, I was the girl who brought her mom. I was slightly terrified. Between players and coaches, girls hockey was not kind to me in the past. But Digit Murphy, the coach of the team, was the best person I have ever met, hands down. Her passion is unmatched. I hung onto every word she ever said. It was one of those, you say jump I say how high situations. She really looked out for me too. I traveled back and forth from Philadelphia to Boston whenever they needed me. She helped me find places to stay, set up all my travel, and include me in every part of planning on/off-ice and behind the scenes. Then, the women on the team (majority of the US Olympic team) were true professionals. They took me under their wing, especially Gigi Marvin, Kate Beusser and Caitlin Cahow. They had me tag along and train in the morning at Harvard with the USA team. We’d jump on the ice to coach prep school teams. Then we’d end the night with Boston practice. I loved it—hockey all day every day. To end that year with the team in Markham and be part of their first Clarkson Cup win was the most amazing experience of my life. I had a decision to make, though: try to make the team again next season, or focus back on my coaching. I got my year of the dream and I learned so much. I wanted to focus back on coaching and was ready to coach girls hockey after my experience with Boston. Since then, I’ve finally found a home where I’m truly happy coaching. There’s always ups and downs, but I’m constantly pushing to give my girls better experiences and opportunities than I had in the past. We’re on the verge of something really special with our organization and I’m thankful to have such a supportive staff around me. I’m especially lucky to have my boyfriend coach with me, we’ve been coaching together for the last three seasons. It’s so nice to have him with me on and off the ice to keep me sane—plus he’s absolutely adorable with the girls. I can’t imagine where my life would be if I didn’t start playing in 8th grade. So, the moral of my story: don’t be afraid to start at any age. Be fearless and overcome adversity. Love what you do. Put yourself, or your kid, in a position to succeed. Support those around you. Maybe one day, you’ll have your own amazing story that will inspire someone else.